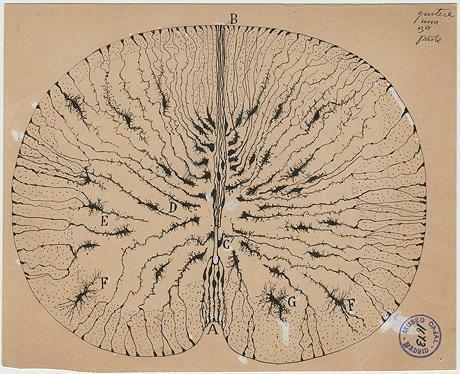 Santiago Ramón y Cajal, Glial cells of the mouse spinal cord, 1899, ink and pencil on paper. Courtesy of Instituto Cajal (CSIC). CHAPEL HILL – In spite of having been one of the geniuses of the 20th century, his renown is very limited. Practically all the towns in Spain have a street, an avenue, a park or a hospital dedicated to Santiago Ramón y Cajal (1852-1934). He was the true discoverer of the neuron, the basic unit of the brain, for which he received the Nobel prize in Medicine in 1906, together with his Italian colleague Camillo Golgi. Ramon y Cajal was a native of Petilla de Aragón, a tiny hamlet in the province of Navarra, (with a population today of 30 residents), landlocked in Aragona. He traveled more than others, as a medical doctor in Cuba, a professor and director of a laboratory in Saragossa, Valencia and Madrid, but he remained faithful to his roots and to art, the passion of his youth. He cultivated it in his own way, by drawing nerve connections. He is said to have done some 3000 delicate drawings in Indian ink, kept at the Instituto Cajal in Madrid, a well renown center for its research in neurobiology. But they have rarely been shown in a museum. We finally have the opportunity, but if interested one will have to travel far, to North Carolina. • The Beautiful Brain: The Drawings of Santiago Ramón y Cajal at the Ackland Art Museum, from 25 January to 7 April 2019. PARIS – There are works by Durer as well as by Toulouse-Lautrec, others by Rubens as well as Chagall. These treasures on paper span over fie centuries. What institution among the Louvre, the Met, or the National Gallery could own all of this? Actually, in this case, it is the Pushkin museum in Moscow and the exhibition is at the Fondation Custodia – a match that has never been seen before. A drop out of the 27 000 drawings the institution owns that allows us though to distil a few treasures. Let us take a few examples: the studies Cavalier d’Arpin made of saint Matthew for the Contarelli chapel in Rome, which did not meet the success expected. He was put aside as a certain Caravaggio was preferred. The Portrait of a young woman by Van Gogh is simply the only drawing by the cursed artist in the public Russian collections. La Danse was the proposition Matisse sent famous collector Chtchoukine and which convinced the latter to commission an ensemble that sits today at the Hermitage. But as we are speaking of a Russian collection, it also includes works by Tatline, Malevitch and the lesser known artists Deïneka and Koupreïanov. • Le Musée Pouchkine. Cinq cents ans de dessins de maîtres at the Fondation Custodia, from 2 February to 12 May 2019. Frank Stella, Gray Scramble, 1968-69, oil on canvas, 175,3 x 175,3 cm, Solomon R. Guggenheim Foundation, New York, Hannelore B. and Rudolph B. Schulhof Collection, bequest of Hannelore B. Schulhof, 2012. © Frank Stella, by SIAE 2019. VENICE – The Peggy Guggenheim Collection received a true little treasure in 2012: the Schulhof, long time friends of Peggy’s, left her as a legacy a number of works that span over four decades of Western art, from WW II to the 1980s. American and European artists mingle together, with Rothko and Ellsworth Kelly rubbing elbows with Afro, Fontana and Burri. These 80 paintings explore first and above all the domain of abstraction. This ensemble was at the heart of a legal fight in France, since Peggy ‘s heirs felt that the Foundation had gone against the will of their famous ancestor by accepting this legacy. The Court of Cassation judged against them in March 2018. • Dal gesto alla forma. Arte europea e americana nella Collezione Schulhof à la Peggy Guggenheim Collection, from 26 January to 18 March 2019. MADRID – The wall! The wall! Trump hollered. But he seems to have lost the battle. And yet, how many creators, inventors, champions, and artists crossed the Southern border to become, in turn, good Americans? Anthony Hernandez (born in 1947) was one of those sons of immigrants. He fought for his new country in the war of Vietnam. It was then that he discovered the unexpected, the art of photography through a magazine – Artforum- his aunt sent him. He developed a true passion that led him to photograph, over the next fifty years, practically one sole subject: Los Angeles. First in black and white, then in color, he seized the urban vitality of the city, a multiethnic symbol and Chicano capital. • Anthony Hernandez at the Fondation Mapfre, from 31 January to 12 May 2019. Can an artist save the world? Should artists be observers or militants, aesthetes or action men? At the time of Anthropocene, i.e. the geologic period when human activities had a significant impact on Earth’s ecosystems, the second thesis is given preference. The artist must be in the avant-garde of a change of mentalities, to contradict Edgar Morin’s theory, according to which Homo sapiens sapiens actually became Homo sapiens demens, given how he enjoys destroying his living conditions. The author presents the pioneers of work with the earth, water, the elements (Christo, Smithson, Turrell, Gina Pane, Ana Mendieta), and shows how current creators are pushed by urgency to intervene in increasingly political ways– like Beuys at Kassel in 1982 when he planted 7000 oak trees. His objective was to respect the tree, to enter the era of ecosophy (at least the Greek language benefits from the environmental crisis!) Particle Falls by Andrea Polli (visualizing the rate of fine particles) or Fukushima-Dynamo by Yann Toma (parable on the Japanese nuclear accident) are but a few recent examples of this committed art. • Un art écologique. Création plasticienne et anthropocène, by Paul Ardenne, La Muette/Le Bord de l’eau, 2018, €27.